On Sunday, Miss Universe 2012, American Olivia Culpo, sat on the marble ledge with the Taj Mahal looming in the backdrop – in the exact spot where Princess Diana once posed in an iconic photograph (appropriately dubbed the Diana Seat). The 21-year-old from Rhode Island wore a long peach-colored dress and chic branded shoes, with fashion photographers snapping away. Culpo was in the midst of a 10-day tour of the subcontinent. It seemed innocent enough, but one caretaker of the “monument to love” wasn’t impressed. Munazzar Ali of Agra’s Archaeological Survey of India (ASI) was quoted by tabloid Mid-Day as saying that Culpo’s posing at the world famous mausoleum “amounts to disrespectful and insult.” Apparently, Culpo placed a pair of sandals on the famous ledge once sat upon by Princess Di. The Hindustan Times described a scene in which Culpo “tried one pair after another, posing footwear next to her on a marble platform, in a bag and on her feet.” Ali added that the photo shoot seemingly slipped under the radar, with the Central Industrial Security Force and tourism police noting that the shoot was underway but choosing not to intervene. As it turns out, the legal issue was the commercial intent. “There are strict guidelines against any sort of branding and promotion at Taj Mahal and the photo shoot conducted was without any prior permission,” explained N.K. Pathak from ASI’s Agra branch. Adopt a Heritage: Should Private Companies Be Caretakers of Indian National Monuments? 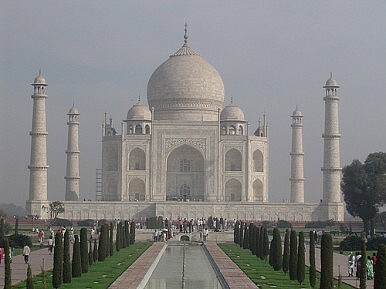 Will sites like the Taj Mahal become better managed or will they become banners for private firms?